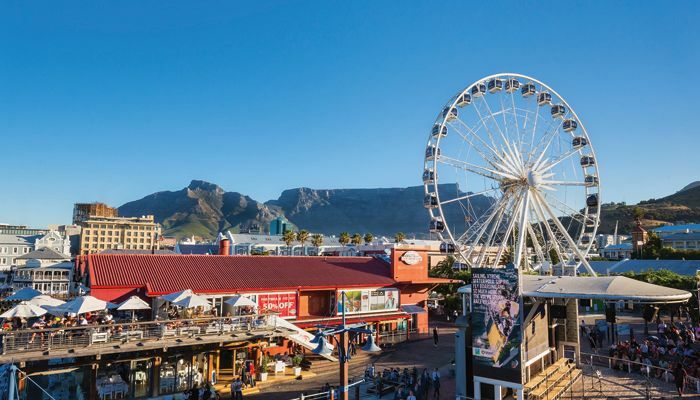 Enjoy this 360-degree panoramic view of Table Mountain, Robben Island, the Cape Town city skyline and local mountains from the Cape Wheel in the V&A Waterfront. Each ride takes four revolutions, lasting about 15 minutes. Enjoy a spectacular 360-degree panoramic view of the Mother City from the iconic and vibrant V&A Waterfront on the Cape Wheel. With 30 fully enclosed, air conditioned cabins which gently rise 40 metres above the ground in safety and comfort, it’s fun for the whole family, all year long. From a vantage point high in the sky, gorgeous views of Table Mountain, Robben Island, the Cape Town city skyline and local mountains are unveiled. The breath-taking display is enjoyed for four revolutions a ride, lasting about 15 minutes. Two wheelchair-friendly cabins are available, making this an inviting experience for everyone. The Wheel of Excellence, now also known as the Cape Wheel, was designed by Ronald Bussink, and was constructed in Germany in 2007. The wheel, which stands 50 metres high and takes nearly a week to assemble, has travelled around the world, visiting Belgium twice, Germany twice and Sweden from 2009-2010. It first visited Cape Town in 2010 where it was initially meant to remain for only a six-month period during the FIFA World Cup. But since then it has found a permanent home at the V&A Waterfront, the oldest working harbour in Cape Town. The City Pass offer does not apply to VIP or Sky Dine rides. Pass discount does not apply to VIP or Sky Dine rides. It seems fairly obvious that you can expect to see an exceptional bird’s-eye view of the V&A Waterfront, Cape Town Stadium and even Robben Island and Table Mountain from the Cape Wheel. But cast your eye a little further and look out for the stunning Hottentots Holland Mountain Range in the direction of Paarl and Stellenbosch. Sunset rides are a priceless experience, and when you couple that with a delicious dinner at the V&A Waterfront, you’re in for an absolute treat. The Cape Wheel is not affected by loadshedding, when areas of Cape Town are given controlled blackouts during high usage. It is kitted out with back-up generators and batteries, and can even be mobilised with manpower. If loadshedding does occur during your visit, you can be assured that you Cape Wheel experience won’t be affected.